Not many people know that Tarangire National Park has the Big Five because the rhino here aren't seen very often. But what makes the park really special are the huge baobab trees (Adansonia digitata). These massive trees, believed to live up to a thousand years old, are dotted all over Tarangire's sandy soil and make for excellent photographic opportunities. The arrival of the short rains in November and December triggers a dispersal of animals away from the river, especially grazers like wildebeest and zebra. January and February are generally dry but the rain returns in March and visitors should avoid the heavy rains of April and May when much of the park is inaccessible and most camps close. 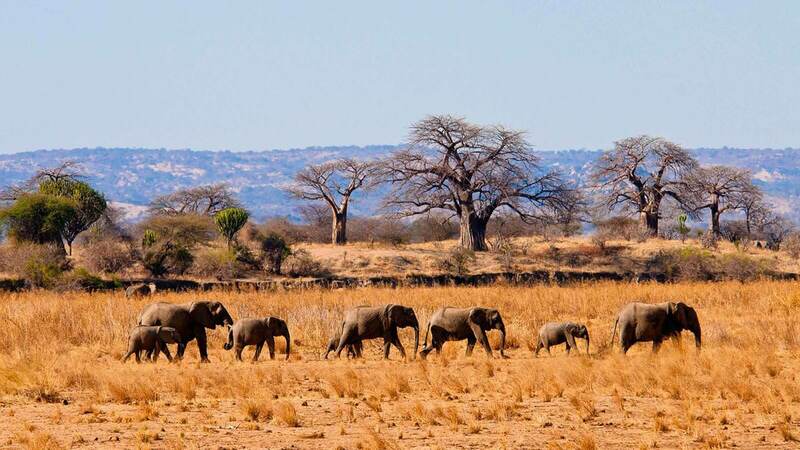 More densely vegetated than the open grasslands of the Serengeti, Tarangire is mostly covered in open woodland with thick forest set along the river – ideal cover for leopards. It’s also the best place in northern Tanzania to see the oddest-looking tree in Africa – the ‘upside down tree’ or baobab. Travellers planning a safari to Tarangire will be pleased to hear that there’s plenty of excellent accommodation available in the park – ranging from family-friendly camps to honeymoon hideaways – and the park combines easily with the Serengeti, Ngorongoro Crater and Lake Manyara to make up the Northern Safari Circuit’s quartet of safari destinations.